Acuité believes that America’s exit from the Paris deal will be an opportunity for India to exert itself. India has been relentlessly expanding its renewable energy capacities over the years and has been one of the prominent pillars of the United Nations Framework Convention on Climate Change (UNFCCC) agreement. With an ambitious target of 100 GW of installed solar capacity by the year 2022, India will contribute to over 12% in the estimated 817 GW global solar market of the time. By hosting the global headquarters of the International Solar Alliance (ISA), under the framework, India has successfully displayed its intentions of becoming an influential and committed solar country. Currently, with an installed capacity (operational) of 12 GW, it contributes less than 4% in the 300 GW global solar grid. As things stand today, expansion of American solar capacity, currently pegged at 40 GW will suffer with the withdrawal initiated by President Trump, who will in turn continue his focus on Shale Gas (Fracking) as well as crude as the mainstay of his nation’s economy. As a result, the plans under the UNFCCC could be seriously impacted with American disengagement as global solar capacities currently comprise of less than 2% of the total. This will leave a room for China to take the leadership position as the world’s largest and most prominent solar energy producer by capacity. Nevertheless, we believe that India’s role will be equally systemic due its significant capacities and influence over PV innovations and cost. The country is currently seeing a massive decline in per unit cost of solar energy (less than Rs. 2.6 ($0.037)/unit) due to rapid capacity augmentations. Much however will depend upon India’s ability to finance its solar expansion and the ongoing developments pertaining to the Paris Deal. The Paris Deal: Why is it such a big deal? The Paris Deal, a follow-up of the Kyoto Protocol and a culmination of COP 21, is a non-binding agreement to contain emissions under the UNFCCC framework and was ratified by 151 nations in 2015. The agreement follows a consensus based approach and operates through peer pressure. Nations will independently decide their Nationally Determined Contributions (NDCs), in other words their contributions in controlling carbon emissions and report this to the UNFCCC. Every five years nations will meet to decide upon the progress made and present more aggressive plans for the following period. While it will be effective only in 2020, the agreement’s narrative is reasonably built around mitigating the impact of emissions & climate change, adaption trough rapid adoption of renewable based technologies and availability of requisite financing. The mission is to contain temperatures to not exceed 1.5-2 degree above the pre industrial level (year 1880) by the year 2030. Under the OECD framework, a 21 member Development Aid Committee (DAC) was constituted in a bid to help emerging market economies to meet their sustainable development goals. The aid was both in terms of finance and technical knowhow and was equivalent to 0.7% of annual GDP of member nations; later on, the UN’s Sustainable Development Goals (SDGs) were also heavily dependent on this clause. The bone of contention between developed and developing countries however came to light after the Kyoto Protocol, the predecessor of the Paris declaration. The protocol had then legally bounded nations to contain carbon emissions and set strict rules for developed nations to be more proactive in climate change risk mitigation. The rules not only concerned themselves a nation’s commitment to itself but also assistance to other less developed countries. Post the Kyoto Protocol, most DAC members (especially G7 nations) continued with their assistance and committed aggressively to cut down their emissions through adoption of renewable sources of energy, especially Solar and Wind. By far the largest economy, the United States was obligated to be more aggressive in this renewable energy push and lead the world in technology, innovation and cost. The American Shale Gas revolution however changed things as aggressive mitigation under the Paris Deal would have forced containment of this promising technology. This in turn would have cost American jobs and near $2 trillion loss in incremental GDP. All this was in addition to massive US Oil inventories and potential Oil reserves in Alaska and the Pacific Rim. The reasons were enough to qualify a pull out as the Americans believed that their economy’s loss would be gain for rivals in Asia. As it stands in 2017, India’s contribution to the total Solar installed capacity is less than 4%, while its economic footprint is 3% in World GDP. With these realities in the background, India’s solar capacities were insufficient to influence PV prices, costs per unit and technological innovations until recently. As understood, the current momentum seen in the Indian solar space only started in 2009, when installed capacity was less than 0.1 GW. Notwithstanding, the growth in the past seven years has been remarkable, with capacities growing 120 times. Since much of the responsibility was with the advanced economies, a higher value add was concentrated there and India was a recipient with no influence in the solar market. However, America’s exit changes things now and India’s relentless solar expansion will elevate India in the global order. If the NDCs, as obligated by the Paris Deal are taken into consideration, India’s contribution to global carbon emissions will be nearly 1.6 Gt by 2030. This will be systemically important since India’s economy is expected to expand by an average of 7.5% over the next decade and its economic footprint will increase significantly in World GDP by 2030. In order to mitigate the climate change risk, India will be obliged to cut down its emissions through renewable push, which is expected to make Solar contribute nearly 38% of total installed capacity. A further push until 2030 and beyond, as per the Paris Deal’s obligation of more aggressive follow on goals, may take share of renewable (prominently Solar and including Wind and Hydro) to near 50% of installed capacity level. What this would entail is the fact that with an economic footprint of 5.2%, India will continue to contribute nearly 13% to world solar capacity by the 2030 Paris review and will have significant influence as a pricing agent as well as innovator. Only China is expected to be larger than India in terms of capacity and this will give India a major role in the sphere as well. At the more universal level, America’s withdrawal will create a $3 billion gap in the $10 billion pledged so far. With a requirement of over $100 billion to fund the mitigation process between 2020 and 2030 alone, solar and other renewable capacity augmentations will be negatively impacted. Unilateral agencies, commercial lenders and national governments will have to step up and fill the gap in order to help build a sustainable future. At this point in point, it remains to be seen how the intermediaries are influenced to remain committed in their endeavor to support this program. Further a more prominent and active role from the private sector is anticipated to aid the financing needs at competitive rates. The ambitious program laid down for augmenting renewable energy sources in emerging giants such as China, India and Brazil heavily relies on their ability to attract requisite capital. Connected, perhaps the biggest hurdle for India’s solar ambition will be its capacity to finance its growth. Despite the Government push, the solar industry in India has been facing tough times as the power sector remains stressed and thus bankers remain reluctant to finance. Acuité believes that for India to achieve its ambitious targets, there will be a requirement of over $73 billion in project financing (both public and private) spread over the next 5 years. This figure considers an estimated 50% YoY growth until the year 2022 in order to meet the 100 GW target. The Government is expecting 40,000 channel partners within the next five years in order to meet its targets and therefore requisite availability of finance will be a major grey area if not addressed. Considering the fact that currently there are less than 2000 partners, who themselves face non-availability of cheap capital – the situation’s gravity becomes even more apparent. Generally speaking, 100-130% of collateral financing has become a norm in the industry and this is acting as a hindrance for the sectors growth. Even though NBFCs such as IREDA and L&T are offering financial services to solar projects, micro and small projects are not receiving enough attention. Having rated over 500 channel partners, Acuité assess that almost 35% of all projects are startups with no or limited prior experience. Also out of the channel partners rated, less than 12% have a rating representing strong financial and business strength, the rest fall in the moderate to weak performance category. The falling per unit price of solar energy is further leading to uncertainty in the industry as margins are severely impacted, as apparent from the falling reverse bidding proposals. For the industry to function sustainably, the Government must provide a structured road map to achieve targets laid down and provide better transparency regarding regulatory and financial matters. While the Government has been making project financing available through its own means (budget and other fiscal instruments), private funding remains subdued just as in other sectors. Cabinet Committee on Economic Affairs (CCEA) on its part has approved the doubling of the capacity of Solar Park & Ultra Mega Solar Power Scheme. The Union Budget FY18 had announced the Government’s intention of having 20 GW incremental capacity in the Solar Park Scheme. Out of the 50 projects on anvil - each having a capacity of 500 MW, 34 have already been approved and a further 16 are yet to be finalized. Under the scheme, the Ministry of Renewable Energy (directed by the Solar Energy Corporation India) will provide an assistance of $31,250 (Rs. 20 lakh)/ MW or 30% of project cost (Under the National Solar Mission, the Government provides $156,000-195,000 (Rs. 1-1.25 crore) / MW). Total allocation was initially fixed at $12.6 billion (Rs. 8,100 crore) (divided in annual tranches) until 2019-20; with this development however we expect the allocations to increase substantially. At $860 million, the Ministry of New and Renewable Energy (MNRE) received an allocation raise of 25.5% in the Union Budget FY18. The Ministry had recently fixed the threshold price at Rs. 4 ($0.062) per unit for solar power; this price point has been revised down from 4.93 per unit that was fixed the previous year. 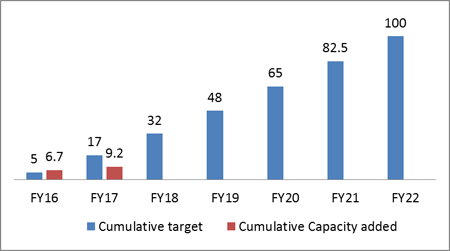 With a tremendous decline in solar unit costs, especially post the competitive bidding for the 750 MW Rewa Ultra Mega Solar Project, the Ministry may have to further reduce the threshold price in the near term. Currently bordering Rs. 2.6 per unit, solar power has taken the competition directly to Thermal Power producers, who offer similar per unit prices. Rising coal prices, import dependent Thermal producers are reeling under margin pressures and may not be in a position to undercut aggressive solar pricing. The Ministry may have to tweak its Viable Gap Funding (VGF) scheme in order to offer competitive bidders more comfort. Notwithstanding the dwindling prices of wafers and other support equipment, we expect Engineering, Procurement and Construction (EPC) costs to remain stable and therefore will remain a major concern for new entrants. Solar energy will play an important role in India’s ambitious plan to attain 100% electrification by the year 2018. Of the 18,452 un-electrified villages reported in India, over 12,500 were electrified recently and solar off-grid solutions will play a much wider role than anticipated. As technology evolves and advancements in lithium batteries allows better storage of energy, solar energy has the potential to become a mainstay of any economy. Irrespective of the obligations of the Paris accord, India can easily become a pioneer in solar technology because of its firsthand experience in initiating change at the ground level. India’s distinct advantage in the current circumstances is the fact that its building brand new renewable capacities without repealing those that are existing, unlike peers who face the daunting task of ascertaining obsolescence. Clearly, with the US vacating a leadership role by exiting Paris, India (along with China) is a favorite to fill the lacuna. Most importantly, this time however it has the capacity to mold the world’s solar technology and narrative in its favor.